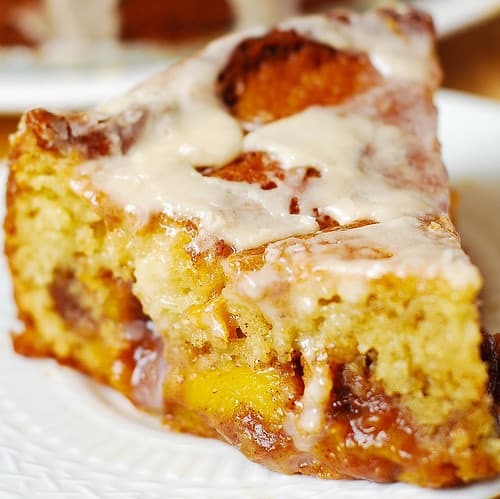 Peach Coffee Cake with Vanilla Glaze – light and fluffy Greek yogurt cake baked with lots of peaches on top (mixed with brown sugar, cinnamon, and nutmeg), and topped with creamy vanilla glaze. Easy coffee cake made in a springform baking pan. 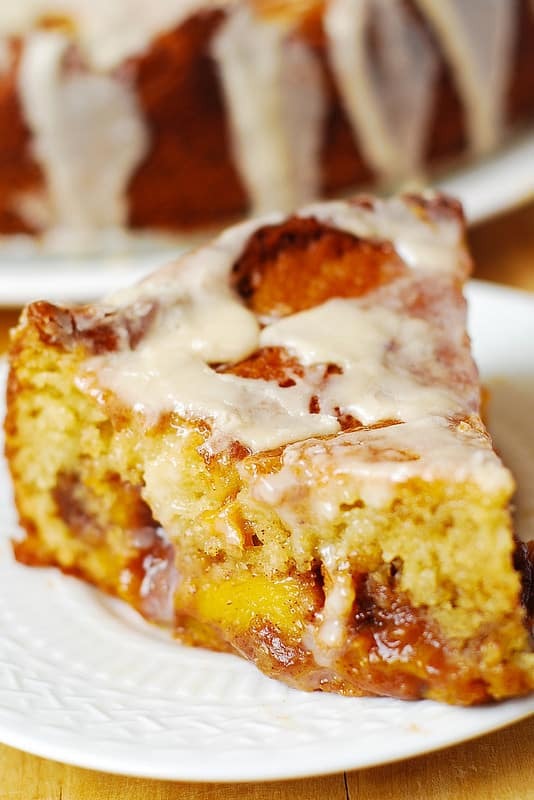 One of the best peach coffee cakes you’ll ever taste! I made this cake using the springform baking pan – it’s perfect for a coffee cake (and no, there is no coffee in this cake, but this cake does taste great with a cup of coffee which is why it’s called coffee cake). Springform cakes are so easy to make, and I’ve made many of them, such as this Blueberry Greek Yogurt Cake or this Strawberry Chocolate Chip Cake. The peach filling of the cake is so delicious: it’s made by mixing together fresh peaches, butter, sugar, cinnamon, nutmeg and some flour. Greek yogurt cake batter produces a very light and fluffy cake texture. 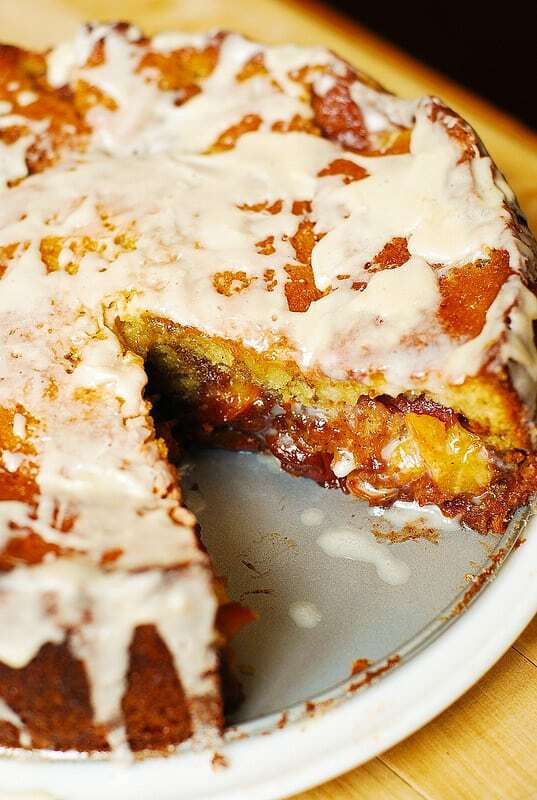 The vanilla glaze makes this cake super creamy, and melt-in-your-mouth delicious! Pour it over the still warm cake for best results. 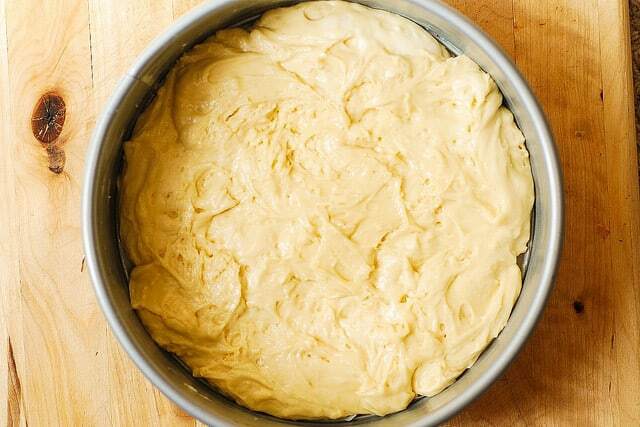 Pour the cake batter into the springform baking pan. 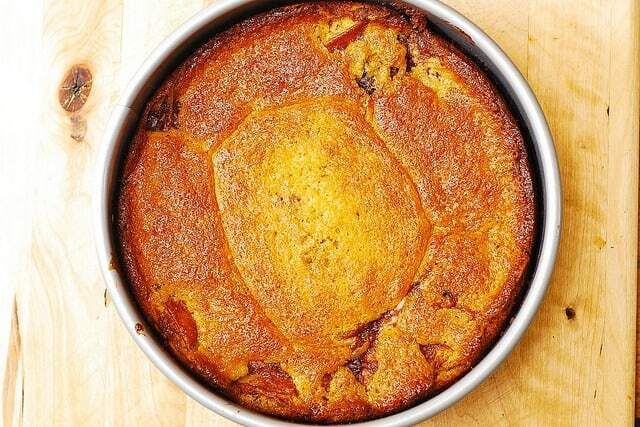 Top the cake batter with 4 or 5 sliced peaches, mixed with brown sugar, cinnamon, and nutmeg. Peaches mixed with all those spices taste so good, even without the cake. I kept restraining myself from eating too many of them. 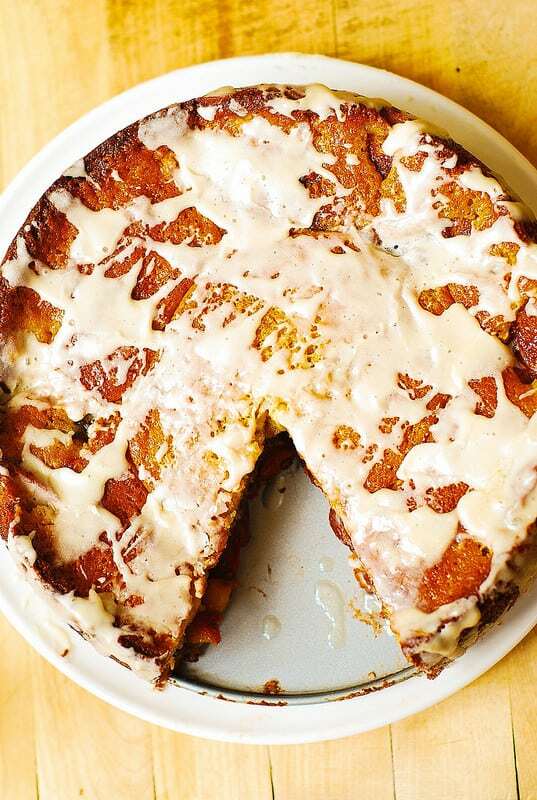 Peach Coffee Cake with Vanilla Glaze - light and fluffy Greek yogurt cake baked with lots of peaches on top (mixed with brown sugar, cinnamon, and nutmeg), and topped with creamy vanilla glaze. Made in a springform baking pan. Use 9x3 springform pan or 9 inch round cake pan. Line the bottom of a 9x3-inch springform pan (or 9 inch round cake pan) with parchment paper. Grease the side of the pan with butter or cooking spray. In a large bowl, mix the sliced peaches, melted butter, brown sugar, cinnamon, nutmeg and the flour until well combined. Transfer the cake batter to the springform pan. 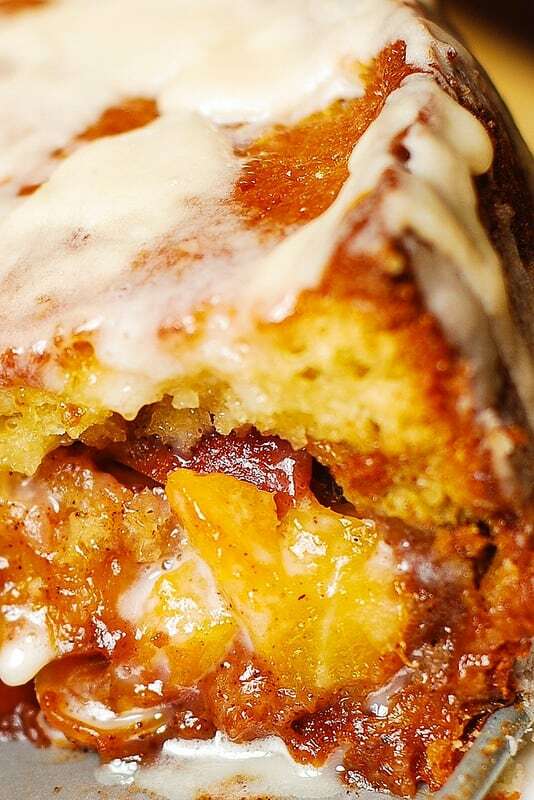 Top the batter with the peach mixture. Bake at 350 F on the middle rack until cake turns golden, and the tester comes out clean in the center, about 45 minutes to 1 hour, depending on your oven. When the cake is done baking, let it cool (still in the baking pan) on a wire rack. After cake has cooled for about 30 minutes, release the cake from the springform pan. In a small bowl, combine softened butter, vanilla extract, powdered sugar and 2 tablespoons of heavy cream milk - mix until creamy. Add 1 or 2 more tablespoons of heavy cream to get the desired consistency for the glaze (thick but spreadable). Drizzle the vanilla glaze over still warm cake. Can you use frozen peaches? The peach truck from Georgia came through and I got a box. No way I could sue them all. I peeled, and froze. I’m hoping I can bake with them! 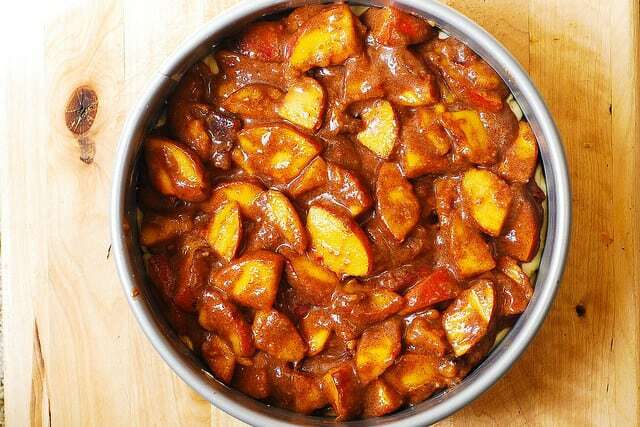 I have not made this recipe with frozen peaches. But, if you can thaw frozen peaches and then use them. Can you use regular whole milk yogurt instead of Greek? Yes, you can use a regular whole milk yogurt instead of Greek yogurt. Bake it at the same temperature for the same period of time – at 350 F for 45 minutes to 1 hour.